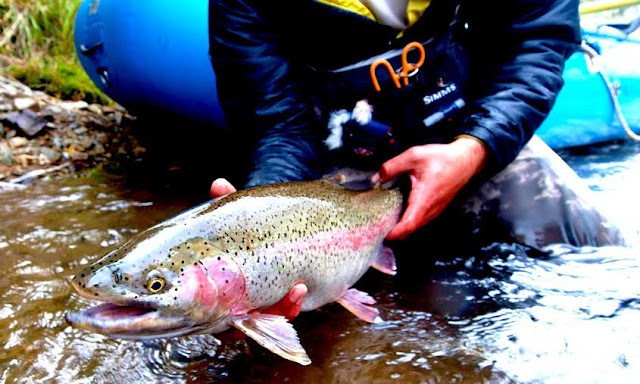 "Our guide service, Royal Gorge Anglers in Cañon City, has partnered with Intricate Bay Lodge on Lake Iliamna, Alaska, to offer a six-day, six-night lodge-based tenkara experience in the Lake Iliamna area. This region is famous for its trophy arctic grayling and rainbow trout during June each year. I could write pages about this area and how beautiful it is, how perfect it is for targeting bigger fish with tenkara, and how great the fishing is, but instead I’ll refer you to Intricate Bay Lodge’s website (see the "Combo Trip") so you can see for yourself and so you can get an idea of what the accommodations are like. All I can say is that there is NO OTHER guided tenkara trip like this anywhere on Planet Earth! Of course, you’re more than welcome to pick up a 6-wt western fly rod and have at it if you like!" (Related aside: Paul is also a regular contributor to Tenkara Angler magazine, having written a great article about tenkara in Alaska in last Fall's issue). Now as much as I'd like to go to Alaska with Paul and a bunch of tenkara rods in hand, I know I won't be able to this year due to other commitments in early June, however, this sounds incredible. My loss is your gain, I hear spots are limited, so if you're interested, you may want to look into it. Tenkara in alaska sounds amazing. How much fun would a trip to Alaska be with you and Owl?